I’ve been lucky enough to work with the wonderful Dina Epifanova, Head of Sustainability at Tetra Pak and her team in Moscow. Here she shares a how system change tools and mind-sets are giving her more muscle where it matters. Why is system change valuable to you? If you want to make a real step change in sustainability, addressing complex social and economic issues, you need to have a strategic mindset and work cross-borders. Influencing factors in our globalizing world goes far beyond a local or isolated context. To succeed in this environment, we need to adopt and use a systematic approach in our daily routine. When you use system change frameworks, you harness greater potential and leverage to reshape the things of concern. To give an example, I applied the framework of ‘Landscape, Regime and Niche’ levels of system change to our recycling development challenge. This brought new perspectives: for instance, at the landscape level, we looked at whether the communities were ready to implement separate waste collection. Earlier, we had considered it as a communications task to engage people with new ways of treating their household waste: challenging and potentially expensive in terms of effort and investment, but still manageable. With the ‘landscape level’ lens, we realized it is not that simple: you need to consider whether communities wish to change their habits. This is not a manageable object, but a variable one, that influences and even determines the probability of your success in change management here. So, now, when analyzing where we should start deploying separate waste collection in Moscow, we compare the districts, based on their communities’ readiness to sort out waste. We have some data, available from waste management companies, that reveals where there is a lot of potential, due to the social characteristics of the given population, that unexpectedly have huge amplitude in one and the same city. I also had an unexpected and valuable insight: just how much attention a system changer should ideally pay to his own role and personal development as the driver of the change. This has brought me to another level of self-reflection and system change capability. I’ve also found this useful for other spheres, such as self life-coaching. I believe corporates should start a more decisive walk towards this kind of knowledge and skills. How else does system change feature in your work today? Being Head of Sustainability at Tetra Pak, I face system challenges in three major areas: climate change commitments, Forest Stewardship Council-certification deployment, and post-consumer waste recycling. For all of these challenges, we can no longer afford to create ‘faster horses’ – to refer to Henry Ford’s metaphor: we absolutely need new ways of moving forward. How does Tetra Pak approach system change? At Tetra Pak, we realise very well that the modern world is changing rapidly, and we have consciously focused on change management capabilities and tools. System change complements this approach, and is crucial to meeting our sustainability goals. The first thing on the agenda today is to actively search for the right allies to drive environmental issues at full speed. Our indisputable benefit here is our long-term approach, which has been always in the company DNA. Our Scandinavian corporate culture complements our sustainability efforts. We are ready to lead the process, rather than wait for requests from our customers or consumers. To achieve success in any systemic change, someone needs to take a risk and become a moving force to lead the process of change. What is the appetite for system change in the regions where you work? The level of societal maturity affects the appetite and need for system change and a sustainability agenda. I work in the markets of Eastern Europe, Caucasus and Central Asia. Here, a company seeking to advance sustainability faces two major challenges. One is that local markets and infrastructure are not yet at the level of the advanced consumer when it comes to sustainability. A buyer can face frustrations when wanting to find out if a carton is FSC-certified or not, or find themselves pushing for separate waste collection. On the other hand, now is a great time to push for this kind of change in the region, as most of these countries find themselves currently in big shifts. This means consumer mindsets are moving and prepared for the change, with sustainability no exception. How ready do you feel various countries in the region are to embrace system change? All countries here are now going through major historical system changes, in the scale of decades or even centuries. This, on the one hand, makes the societies quite adapted and ready for changes, but on the other, if recent changes were too painful, it can have an opposite effect, resulting in huge demand for stability. We will see, for instance, in Ukraine – a country of believers in European values and political practices – readiness for change is high. In Russia, on the other hand, the changes that the country has gone through in the recent decades were so painful that the majority of the population is keen to keep stability. The paradox is that years of rather short-term decisions, especially in economics, have brought Russia to the point where system change is critically needed to keep any equilibrium: without it, wider changes will inevitably catch the country unprepared. What ways forward do you see for Russia? Even though the appetite for system change here is the lowest in the region discussed, you can nevertheless easily find two powerful sources of system change here. The first is the government: the political elite understands clearly the need for change – satellites fall down, weapons are not that good, economic reserve has been used and eaten, political ideas have up short too: take Syria for instance. As in Mikhail Korostikov’s “honey-badger doctrine” the current political strategy is very effective, but works for survival, not for growth. The good news is that the government puts this need for change into action. One example is appointing a 35-year-old Maxim Oreshkin to be the Minister of Economic Development, with a personal assignment from Mr. Putin to implement effective KPI-based frameworks to raise the professional level of management and, if successful, to scale the practice to other ministries. Another source of system change in Russia is the new generation, which hasn’t the trauma of the 1990s’ hunger and criminal years, and which now lives in the completely new reality of the digital world, with no sense of limitations. Any serious barrier that they will face later will be absolutely not understandable and not acceptable to them! These young and free-mind people will be big change drivers: we only need to wait some 10-15 years. As Vladimir Trofimchuk, Trade Policy Department Consultant at Eurasian Economic Commission, puts it: each country of the former Soviet Union block is now shaping its national identity and has to refresh its understanding of its political allies. All of them are facing now changes in politics, economics and even religion (for instance, the rise of Islam in Azerbaijan). This is creating a different appetite for system change, depending on the specific situation in a separate country. What the different countries have in common is that the whole region is today in tectonic system change process and this is a huge opportunity knocking. Yesterday we introduced you to the exciting, innovative Climate Finance Accelerator, bringing countries and financiers together to co-create solutions to meet climate commitments. This is the second in this series, following the process and highlighting insights from the day. Today country delegates were paired with experts from international banks to discuss the enabling environment within each country involved. This was in order to understand which projects to prioritise and what financing mechanisms would be most appropriate. This technical deep dive session took a sector by sector focus to explore barriers to financial access and potential solutions. All change happens in context and today’s process enabled finance participants to better understand the specific market conditions in each country, discussing policy and regulation, financial and economic, technical and market, social and cultural factors in detail. One delegate said that her views of emerging market opportunity had shifted because she’d realised that for the country she was involved with climate change was a very live issue and finding a solution is viewed as a necessity. This meant that engagement with both government officials dealing with extreme weather conditions and communities’ dealing with livelihood loss was easier and faster, than in other, more developed and resilient countries. The afternoon plenary was opened by Dr Daniel Klier from HSBC, who heads up both strategy and climate finance for the bank. His compelling presentation outlined the gap the Accelerator is here to fill – pointing out that, based on HSBC research: 97% of investors want to increase their climate related investments, yet the market was viewed as ‘shallow and illiquid’, with a lack of clear definition on climate investment or transparency of opportunities. He stressed that the finance community has a role to play in creating liquid markets through standardisation, working closely with transition clients to reduce risk and in improving transparency through better data and disclosure. Part of the discussion across the groups centered on how to create a narrative to maximise the benefits and impact of investments and create access to more sources of finance. An example was how to finance fresh food value chains in Nigeria – to focus on strengthening local value chains for better production to create jobs, resilience, and shift from import dependency. The tomato crop alone has a deficit of 1.2m tonnes that is created by under-production, spoilage and lack of adequate distribution. This is an opportunity for the economy that could support climate-smart agriculture and local livelihoods. All the teams noted that it was harder to work on agriculture than on transport and energy – yet this sector was vital for the transformation of these economies both because of the high climate impact and because of the co-benefits in livelihood and community development. Agriculture initiatives engage rural populations and support political stability. It was noted that taking a regional, portfolio approach might allow for insurance which would lower risk and make projects more attractive to finance. A similar question arose on how to best package and then measure smaller energy efficiency projects – vital for the transformation – for financing. While there are nuances at sector level in each country, the similarities of the challenges faced allows for cross-pollination of ideas and sharing of precedent and practice. A call was made for an ongoing platform to be created to support countries in sharing experience. Nigeria was paired with Deutschebank. The team developed a set of criteria to evaluate projects based on a detailed discussion of enabling environment. These included: having generation and distribution embedded in the community, developing clusters below 1MW to side-step time consuming regulation, ensuring developers and project leads have strong track records and focussing on smart models to collect money. A delegate from the country said a key insight for him was to how to approach and set up investments to better protect investor money. Nigeria is focusing on 3 mini-grid projects which will engage multiple communities. Mexico worked with a team from HSBC. Looking at the transport sector, they expressed the need for supportive policy at all levels of government. They used precedents internally and from other countries, particularly Bogota in Columbia, to learn how to transform transport. Insights included exploring the opportunity for electro-mobility working firstly with taxis and distributing subsidies for a shift to electro-mobility directly to the end-user. However, there are still many questions on how to incentivise the shift, access best practice and technical assistance, invest into technology – particularly software required, develop T’s and C’s for fleet renewal and leverage international pressure to support the transformation. A similar dialogue in the Mexico team on the energy sector raised questions on how to fill capability gaps, create working renewable systems and overcome “oil inertia” in culture and values. A delegate noted that a recurrent problem of land rights could be overcome through focussing on cash flow guarantees. The Columbia team, working with BNP Paribus took a systems approach to the projects they set-out. This meant looking to expand large, bankable projects to incorporate other, smaller projects that were less easily financed but vital to the transformation of sectors. They looked, for example, at how to incorporate the development of bike lanes (which are hard to finance) with the larger metro development project to enable a complete transport system. A question they worked with was how to access funding not only for the project but to address the enabling conditions to better make the project work. The day closed at the Crystal Exhibition on Sustainable Cities with inspiring talks from Pete Daw of Siemans and Matthew Scott from the Bank of England with insights on crowding in private finance and creating orderly transitions. Day 3 is about priorities and we will dive deeper into the opportunities. A fascinating take on expanding design thinking towards systems change from the brilliant Rowan Conway of the RSA. First published on RSA site on 26 July. After a prolonged adolescence where style perhaps outweighed substance, design thinking has grown up. Now is the time to combine design methods with systems thinking to enable the adaptive and innovative institutions we need for the future. We live in disorienting and challenging times. As society becomes more networked, the traditional centralised power of governments is under pressure. It’s a tough time to be a political leader attempting to deploy tried and tested tools when society no longer behaves in tried and tested ways. Those formal, linear, definitive strategies that once cascaded down from a central point are now under continuous challenge by a youthful networked power that is digital by default and quick to adapt to change. Design thinking was born of this youthful zeal and the last 10 years has seen a profound shift in what we understand as design. Driven by the exponential growth of the social web and digital services, designers have gone beyond the classic understanding of design as producer of artefacts, into design as creator of services, policies, processes, business models and governance structures. Human-centred design thinking methods — and service design in particular — have infiltrated business, government and third sector institutions and reinvented the way they approach innovation. And this in turn is disrupting traditional notions of how policy-making, business development, R&D, organisational design and strategy are done. 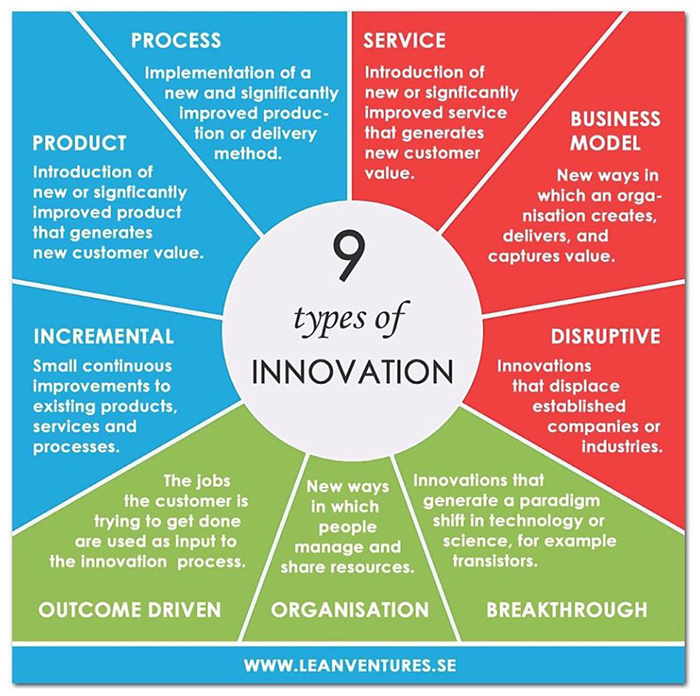 As this diagram from Lean Ventures shows, rather than providing a clear route to a single solution, design thinking methods lead to many solutions, stimulating creativity and idea generation that arrive at a variety of innovation types. Designers are beginning to answer this call. With design thinking methods at their disposal, they are now setting their sights on the grand social challenges of our time. In a 2017 RSA lecture, Jeremy Myerson, founder of the Helen Hamlyn Centre at the Royal College of Art, described how designers are responding to the modern challenges of public health, climate change and inequality. He pointed in particular to our ageing population, and how it is both opening up new consumer markets for products like the ‘grankini’, while also providing opportunities for designers to tackle major public service challenges by reinventing services for the care of the elderly — in particular the rising demand for person-centred dementia care. Recognising this asset, government agencies are now routinely seeking to commission design solutions to problems as broad as childhood obesity and mental health services. Challenge prizes and competitions are the obvious way to stimulate this creativity and tools like the Small Business Research Initiative and the European Social Innovation Competition are enabling government agencies to stimulate enterprise innovation for pressing societal problems. Challenge prizes and competitions do lead to genuinely creative solutions to social problems, but there are many stories of innovations either struggling to grow beyond their test boundaries (ie: failing to replicate a nurse-led solution in one hospital across multiple sites) or make long term traction in wider systems (ie: the challenge of scaling an innovative solution when there is no consumer market demand). For challenge prizes or procurement tools to stimulate sustainable innovation, they need to be designed with wider systems impact in mind. In this new RSA report, From Design Thinking to Systems Change produced in partnership with Innovate UK, we look at how to go beyond the creative process to have real impacts on the wider social systems in which social challenges sit. Our report looks at the UK government’s SBRI procurement process in more detail and suggests ways to support the innovations that it stimulates to have lasting impact. A key finding is that problems aren’t the same as markets. Competition commissioners are rarely the same as the end buyers of the solution and the social challenges or the public service problems that stimulated the brief in the first place do not necessarily equate to clear market opportunities. Challenge prizes or SBRI competitions may create ‘competition demand’, but providing the elusive first customer does not provide a guarantee that there will be a second or third customer. In one case studied, the market demand was so low that it was largely met through the competition, even though the public value of the innovation was very significant. The innovation challenge is not just the generation of good ideas — it is the application of those ideas in the world. It is impact. Design alone won’t always generate large scale impact. 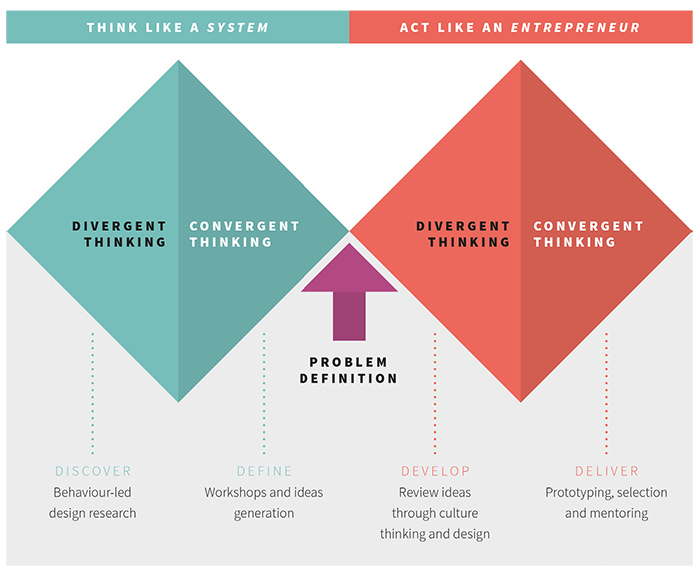 This report looks at how we might apply a systems thinking dimension to design thinking methods, and defines the new RSA model of ‘think like a system, act like an entrepreneur’ as a way to marry design and systems thinking (the below diagram tracks the two modes onto the Design Council’s famous double diamond model of design thinking). Systems thinking augments the design thinking approach by appreciating the complexity of a social problem and seeking to understand factors like power dynamics, competing incentives and cultural norms. Thinking systemically about how problems are defined is an advance on traditional design thinking as it extends beyond the creative process into broader social change theories. There are pioneers in this field like the system innovation lab at Forum for the Future and the Lankelly Chase systems changers programme, but adding a systems perspective to design thinking processes now needs to move from the vanguards to the mainstream. Making change in systems as complex as public health or education may seem insurmountable. Applying a systems lens to the question of how procurement programmes like SBRI might be optimised for innovation, we can glimpse the greater impacts that could be achieved. This is where, at its best, SBRI has the potential to serve the dual goal of both making commercial markets for innovations and delivering social impact at scale. By applying the think like a system, act like an entrepreneur mindset, we do not attempt to take on grand societal challenges in their entirety, instead we look to identify nimble opportunities for change within the system — seeding innovations, testing prototypes and supporting successful efforts to grow and influence other parts of the system. By seeking to understand the wider system that an innovation will be born into, designers can seek to find ways to successfully affect systems change.